When I came in shop there was completely different things on my mind what I have to get, but just passing sales rack I saw this beautiful blue (blue is one of my favorite colors) and this gorgeous floral pattern. Beautiful blooms reminded me of pansies. It brought back lovely memories about my childhood. My mom let each, my brother and me, have a flower bed where we could plant and grow what ever we wanted. We had there growing what ever we could get- some potato, onion, peppermint and pansies. We was so proud about our little gardens, there was even happening a little competition. But what most warms up my heart about this pansy print trousers is that back then my brother had soft spot for these delicate blooms. When ever my mom was choosing flowers for flower beds there was request from my brother for pansies. I didn't bought trousers the same day, I returned back for them after week. I'm glad I got them. Love the mix of stripes and florals and the pop of color here! Hope you are having a wonderful day! Those are rad pants! Love the pattern mixing you did, super bold but it looks fantastic. your hat is so adorable. I love how the trousers remind you of such sweet memories. 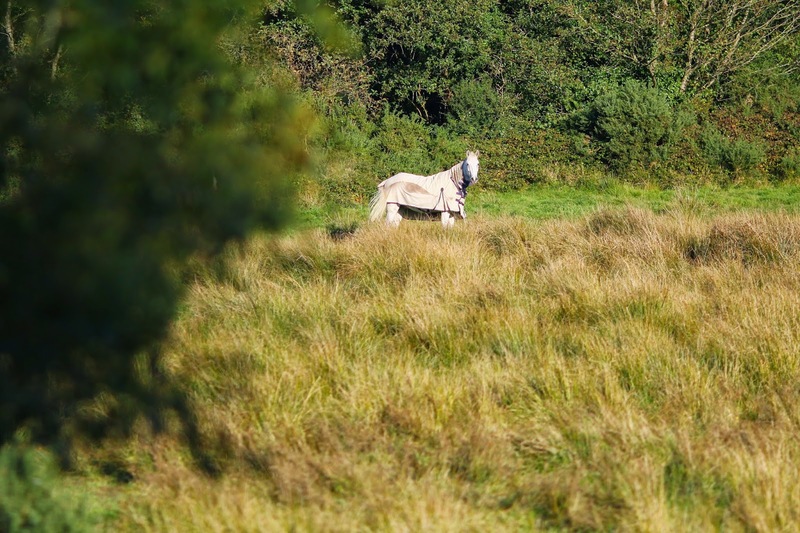 Glad you went back for them and they were there waiting for you! Ramona, you are ROCKING this outfit girl!. I'm hitting the LOVE button on this one. How gorgeous! Love the mix of prints and that bag is FABULOUS. Your bag! I am in love! 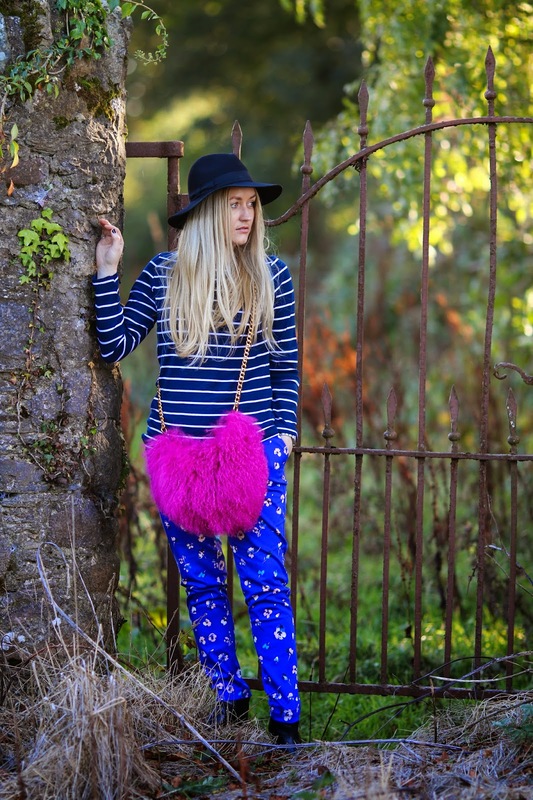 I adore those pants, they look great on you and I also love the fluffy bag! Super cute! I love those pants! Blue looks gorgeous on you with that long blond hair. I think I'd love going shopping with you, you can help me find prints to mix! Wow! 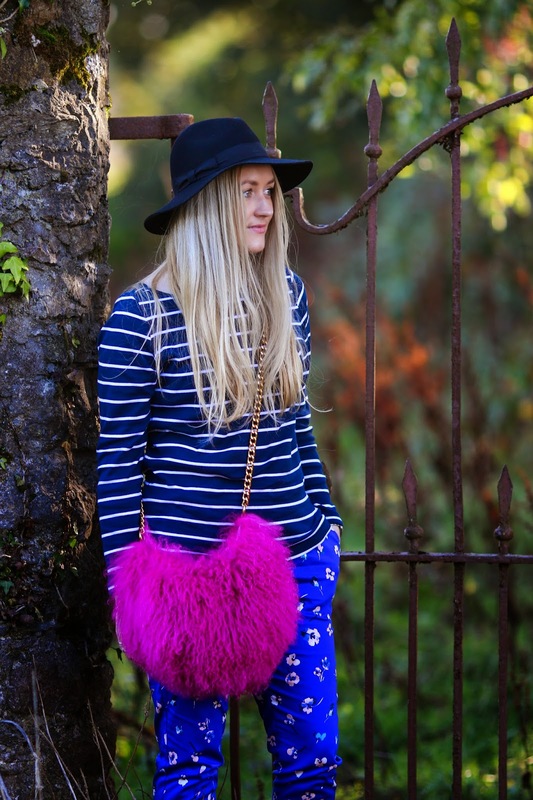 This looks great… I’m loving the hat and bag...fab! Omg that purse is so cool!! You always suprise me with your details. Lovely! Ramona your printed trousers are so beautiful ! I can imagine them styled in so many different ways. Dear Ra ♥, it was the only right idea that you went back to the shop and bought these pants as they are not only perfect on you (and I love it so much that you wear the striped shirt with them) but the best thing is really that they remind you in such a positive way on your childhood! Sounds really like as if your mom is so wise, it is a great idea to give the own children a flower bed and now you have even again pants with the favourite flowers of your brother. Congratulations also to the wonderful photographs, they turned out perfect and I don't know if it's due to the pants that you are glowing from inside <3 Wish you a happy weekend! what a beautiful look! i love it. it's probably my favourite look of yours ! 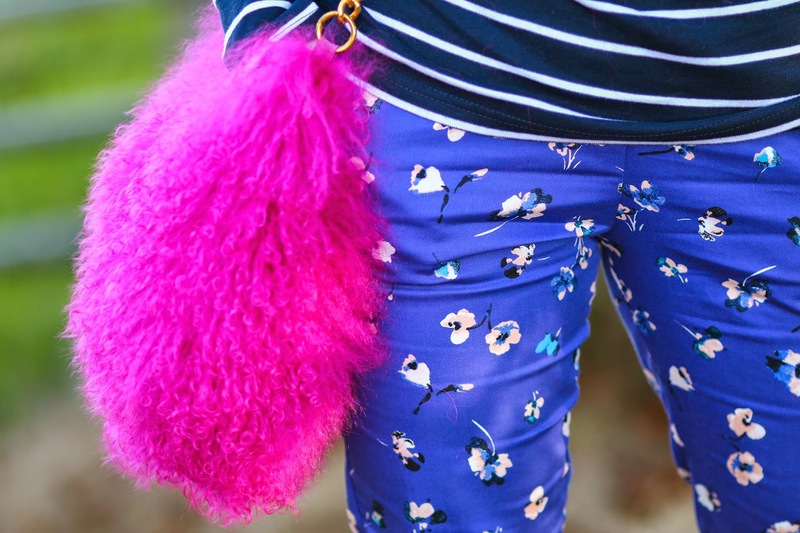 i love the pants & this fake fur bag, so cool! Love the color-block in this gorgeous outfit and those pants are so cute, i can definitely see myself wearing them . Love your furry bag! Styled perfectly!